Dr. Bryan Sykes, founder of Oxford Ancestors has announced that Oxford Ancestors is withdrawing from the direct to consumer genetic marketplace as Bryan retires to live abroad. Oxford Ancestors was the first company to test mitochondrial DNA outside the academic environment available to the public after Dr. Sykes authored his book, Seven Daughters of Eve. Although the book is incredibly outdated today, it was at that time a groundbreaking book that introduced regular air-breathing humans, not scientists, to the DNA of their ancestors. In essence, it started our love affair with our DNA that continues with millions having tested today. In the back of the Seven Daughters book was an order form, and in 1999, I quickly ordered my first DNA test to find out which of Eve’s 7 daughters’ clans I belonged to. For about $900, I received a one page chart in the mail with a star placed on Jasmine’s node telling me that I was a member of Jasmine’s clan. Such was the humble (and expensive) beginning of my two-decade fascination with genetic genealogy. It’s true that every journey of 1000 miles (or 18 years) begins with one tiny step. Dr. Sykes later added a 10 marker Y DNA test for males along with a searchable data base that hasn’t been functional in years. In essence Oxford Ancestors could have been the innovation force to lead the genetic genealogy revolution, but it wasn’t. Oxford Ancestors introduced a few new products here and there over the years, but seemed out of touch with the needs and desires of genetic genealogists. I dug deeply into my own personal archives looking for my user name and password, hoping to check my matches at Oxford Ancestors one last time. I noted from a series of e-mails that there had been sign-in and password problems for years, and sure enough, none of my or my husband’s user names or passwords works today. It really doesn’t matter much, given that only 400 mtDNA locations were tested, not even the full HVR1 region – compared to 16,569 locations in the full sequence test at Family Tree DNA. My husband’s Y DNA tests are irrelevant too, with only 10 STR markers. Hubby and I both retested years ago at Family Tree DNA, as did any other serious genealogist. I’m just incredibly, incredibly grateful that my deceased mother’s DNA was stored at Family Tree DNA who retains customers’ DNA for 25 years to afford the individual (or their legal heirs) the ability to upgrade with new tests as the technology improves. If mother’s DNA was at Oxford Ancestors, I’d probably be singing an entirely different song right now. If you’re interested in trying to sign in to Oxford Ancestors one last time, do so soon. Dr. Sykes says the data base will remain online for a few months, but with the GDPR deadline looming on May 25th, I’d speculate that the data base might be taken offline just before that date. It was difficult to find the location to sign in, but it looks to be in the green section of the Database Search Zone, (bottom option at left on the sidebar) that brings you to this page with the green sign-in box at right. The saddest part of this obsolescence event is that because Dr. Sykes’ project began in 1996, he assuredly has samples from many individuals who have passed away. His data base, when no longer available in any capacity (even though it hadn’t been working correctly in years) will take with it the genetic results and genetic history of many individuals that will be irreplaceable. Never recoverable. Gone forever. Even though only a few genetic locations were tested, in some cases, some knowledge is better than no knowledge – especially if those people didn’t test elsewhere and/or their line has died out. I hope that some effort might be made to transfer ownership and stewardship of the database (perhaps) to a nonprofit type of entity (ISOGG?) who would strive to maintain the database in some format. It’s heartbreaking to see 21 years of DNA samples from Oxford Ancestors join the defunct data bases of both Sorenson (purchased by Ancestry) and Ancestry’s own Y and mtDNA data bases – both of which met the same fate. Lost forever. It’s akin to deleting the lineage stories of our long deceased ancestors. Kind of like burning the genetic library. Travesty isn’t a strong enough word. While this may be the best answer for Dr. Sykes personally, who undoubtedly deserves to be able to retire, it remains a tragedy for mankind (not to mention the testers’ families) to lose the earliest pieces of history collected and compiled in this field. We all need to make preparations to protect our own DNA and genetic records. However, because the strength of genetic genealogy is not individual results in isolation, but in comparison to others’ results, we still need the ability to compare. Unfortunately, both YSearch and MitoSearch, formed as free public entities allowing people to upload their results and compare lost their reason d’etre when other companies stopped performing Y and mtDNA tests. There’s no reason to maintain an external site to allow comparisons from multiple companies when there is only one company testing Y and mitochondrial in this field now, and you can compare directly in their own data base. Family Tree DNA maintained those services, for free, for years. They have graciously allowed the data bases to remain available, but they have not updated them in a long time and the code is exceptionally old. If you don’t have your results elsewhere, either sign in to Oxford Ancestors or contact them, NOW, to obtain and archive your results. Be sure to update your beneficiary form at Family Tree DNA, and be sure that your family knows about your DNA results, location, sign-in user name/password and your desires. Other vendors don’t offer a beneficiary designation, so be sure that your family knows about your DNA locations and how to sign in. Instruct your executors as to how to deal with your DNA at locations that require a subscription. You may want to include a clause in your will providing direction. Download your DNA results and raw data files for Y, mtDNA and autosomal. Label and date them carefully. Archive in multiple locations, on multiple computers and on multiple kinds of media. Be sure at least one copy is stored outside your home in case of disaster. Upload your Y and mitochondrial results to YSearch and Mitosearch, if possible. If you download directly from Family Tree DNA (at the bottom of your matches page,) even though an error message is returned during that process, your results are still being added to the data base. You can confirm by clicking on the “Upload to YSearch (or MitoSearch)” button at the bottom of the Y (or mito) matching page again, and your YSearch (or MitoSearch) ID will be displayed. I would not suggest depending on this resource either, given its age and the fact that it is far beyond its anticipated lifespan. One of the best things you can do with your autosomal results to assure availability is to be sure they are stored in different locations. Fortunately, several companies facilitate uploading information from other sites, which you can later download if need be. In other words, “spread the love” in the form of your DNA file. You benefit now by fishing in multiple pools for matches and later by making sure your DNA is not just in one place. Of these, both Ancestry and MyHeritage either restrict the services or the size of your (free) tree utilized for matching, so unless your heirs maintain a paid subscription at some level, your results may not be able to be utilized to their full matching capacity. Both provide some level of free matching without full services. Not every vendor accepts all results from the other vendors due to chip incompatibilities. You can see which vendors accept whose files, and versions, here. To make your DNA results immortal and insure that they continue to reap benefits not just for you, but for your descendants and those who you match as well, transfer your results to as many (legitimate) places as possible and please, please upload or create a corresponding tree. Genetic genealogy today and in the future relies on DNA test results compared to others AND genealogy. Preserve both! Your DNA is the legacy that only you can provide. Don’t let a company’s data base closure rob your descendants. This entry was posted in Beneficiary, Mitochondrial DNA, Oxford Ancestors, Y DNA and tagged General Information by Roberta Estes. Bookmark the permalink. Just a word of caution, although FTDNA promises to hold the samples for 25 years, that isn’t a guarantee that the sample will be viable at any point in time. We just received word that the sample for one of my cousins, who died in 2008, is no longer viable for further testing. We discovered this after adding on the AT and mT tests. We luckily got the AT, but alas no mT. I don’t know that we would have chosen differently had we known, but we certainly would have had a discussion about it. Yes, that’s true. Sample viability is problematic. You can also request additional vials, at no cost. Hello, may I also suggest Geni.com as an upload location for DNA data? It actually accepts both Y- and mtDNA data beside usual autosomal data. More importantly, it provides matching for all three types of tests. And while the matching is very basic, the service is heplful in propagating Y- and mt- haplogroups to all the relatives of the appropriate line in your tree. There’s “Partner Application” section on FTDNA dashboard for connecting with Geni, so one doesn’t even need to download and upload any files with DNA results – everything happens automatically. 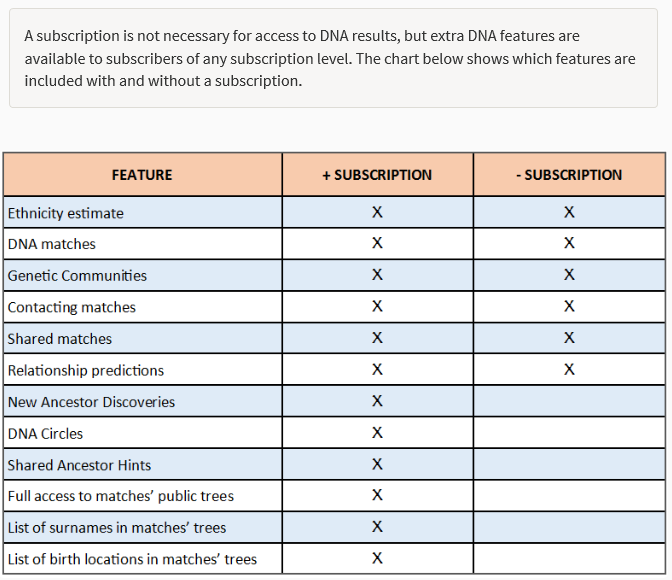 And best part – there’re no limits on your tree size or number of relatives with uploaded DNA for a free members. >Upload your Y and mitochondrial results to YSearch and Mitosearch, if possible. The key words there are “if possible.” I’d rather take my chances that the Detroit Lions will win the Super Bowl next year. Seriously, YSearch has been a JOKE for a long time. I have tried MANY times to upload “my” YDNA results there and have failed MANY times. It could have been HUGE asset if properly configured and maintained. I tested this last night and it uploaded. You receive an error message , but if you search, they are there. Your results are probably there many times now. If I search? I can’t get in! I never could! Either do a public search by surname. Or, click for a second time on the download to Ysearch link from the FTDNA match page and it will tell you the kit number. Of these, both Ancestry and MyHeritage either restrict the services or the size of your (free) tree utilized for matching, so unless your heirs maintain a paid subscription at some level, your results may not be able to be utilized to their full matching capacity. My huge tree that I keep at ancestry won’t be used in its entirety for matching??! That was my point in putting it there. Yikes! I’ve designated my daughter to be my beneficiary at Family Tree DNA (and sent her the corresponding information about that) but I am reminded by your article, Roberta, that there is more for me to do! Having found a really close match only to be told after messaging the administrator that the match had recently passed away and that the administrator could not help, because he had not let his wishes be known prior to his death, I understand the implications! After that message, the match totally disappeared as if it had never been on any database at all! While I did not test with Oxford, I did read the Seven Daughters of Eve, which whetted my interest when I heard Ugo Pergo speak at a local meeting for the Sorenson Lab. I swished and spit into a cup which at that time added me their mtDNA testing and told me I was a T1a1. Another free test from them began our Y testing on the Livingston/Levingston and led me to the FTDNA project for that line. In our family, that is now history. I did see Robert Sykes’ announcement and knew it was the end of an era. Thank goodness we have bigger and better things ahead!! Thanks for your advice on keeping our test results into the future! Sorenson had my deceased wife’s results but I failed to purchase them through their commercial arm, Genetree. Soon as it was announced in 2012 that Ancestry.com had purchased the database, I pleaded with AncestryDNA to let me purchase her results. Nothing doing. When I learned they planned to destroy the samples I knew any further efforts were fruitless. My children would never know what their mom’s autosomal DNA or mtDNA might have looked like. We’re fortunate that my wife had sisters who can test. Others may not be that fortunate. You’re not alone. I know that’s no consolation. A lot of begging went unanswered. The genealogy community – although large in number – is quite collegial and as a result small, well connected and always sharing. I do wonder when I hear that Ancestry or some other corporation providing services to this community does not respond to requests for help or to make changes that would probably improve their product. I have heard about genealogists who have good suggestions for product improvement but are ignored even though you’d think they would be voices one would listen to. But begging? Why on earth would Ancestry ignore that? That lack of response – seemingly cold hearted – makes it look tone deaf. I find it very unnecessarily political this GDPR was enacted as law, because it’s causing the withdrawal of lots of socially beneficial products and caused the withdrawal of the public Y-DNA & mtDNA databases. It was via the public Y-DNA and mtDNA databases I discovered over a decade ago that my surname likely originated near the current border area of County Roscommon & County Mayo and that my mtDNA likely originated, or at least found the cultural conditions needed to thrive in east central Finland. Luckily I recorded the some 35 results from the mtDNA database on Google maps but the Y-DNA database I didn’t record because it amounted to only 2 people in County Mayo. I also 1st tested with Oxford Ancestors but I don’t remember the year but it wasn’t long before I did my test with FTDNA so likely in 2002 given how long it takes to get results back. I only did their Y-DNA test as I at the time didn’t realize they had a mtDNA test available. It was their Y-DNA results and their nonchalant response ‘that it is known our results will be wrong many times’ when I told them that the origin of my Y-DNA (they had me in their grouping of Anglos, Saxons & Jutes) that they were telling me was wrong rather than saying ‘We are continuing further research.’ and will improve our research. Oxford Ancestry had the feel of an academic resting on his past laurels and then using his credentials to profit off the general public which, as it turns out, exactly what that company wound up being. Contrast that to FTDNA whom I received a surprise eMail from in 2006 telling me from the founder himself that their research had found out something archaeologically exciting about my Y-DNA. Now in 12 years time since then I’ve learned quite a bit about my genetic ancestors that no paper trail would ever have revealed.